FedEx Corporation’s shining moments this year. FedEx Corporation (NYSE:FDX) stock trailed both competitor United Parcel Service (NYSE:UPS) and the S&P 500 (SNPINDEX: ^GSPC) this past year. But despite lackluster market performance, FedEx also had its fair share of positive publicity. Here are three of the best FedEx Corporation headlines in 2015. FedEx Corporation missed earnings estimates for two of its four quarterly reports that came out in calendar year 2015. Analysts were pleasantly surprised by its first and last announcements, but disappointed by the two in between. These reports don't live up to United Parcel Service's, whose last five quarterly announcements have met or exceeded analyst expectations. Taken together, however, FedEx's calendar year 2015 earnings came out ahead, clocking in at a total $9.86 earnings per share, $0.18 ahead of combined quarterly expectations. 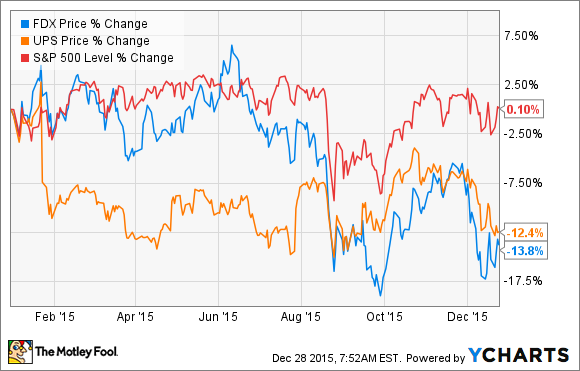 Its latest earnings announcement, on Dec. 16, was greeted with especially strong gusto. FedEx Corporation is exceeding its goals linked to a $1.6 billion profit improvement program, reported on new strategies to win the e-commerce delivery war against old rival United Parcel Service and new competitor Amazon.com, and maintained its fiscal 2016 guidance (after downgrading earlier). The best FedEx Corporation headline was undoubtedly its announcement in April that it had agreed to buy Netherlands-based TNT Express for $4.9 billion. That's quite a chunk of change for FedEx, equivalent to more than 10% of its fiscal 2014 sales and almost five times its net profit for the same period. But for FedEx, TNT Express is an opportunity to expand into Europe and reach the sort of scale competitor United Parcel Service has long enjoyed. FedEx received the go-ahead from European and U.S. regulators a few months ago, and expects to fully seal the deal by mid-2016. If all goes as planned, the newly combined FedEx/TNT Express European logistics company will capture 17% of the Continent's market share, making it the second largest after Germany-based DHL Express. FedEx Corporation's final best headline for 2015 is bittersweet. During its latest quarterly report call on Dec. 9, the company told shareholders it expected to move a whopping 317 million packages between Black Friday and New Year's Eve -- a new record and 12.4% more year over year. That's great news for investors (like myself) who are hoping to cash in on long-term e-commerce expansion, but bigger isn't always better. Memphis-based FedEx got slammed with a storm and even greater than expected volumes in the days leading up to Christmas, causing the company to fall short of timely delivery on a (currently undisclosed) number of packages. While FedEx employees were still out delivering on Christmas day, United Parcel Service employees had parked Santa's sleigh by 8 p.m. on Christmas Eve. There's no beating around the bush -- 2015 was a tough year for FedEx. The headlines above don't make the "best" list because they're perfect. They're the best because they present a balanced perspective of the current and future situation for FedEx Corporation. With $11 billion in assets, FedEx has built itself into a logistics empire, but that empire is growing and adapting in ways it never has before. In 2016, investors would be wrong to expect slow and steady earnings from the company. FedEx may miss again on future reports, it may make daring moves into new business or geographic areas, and it may suffer growing pains as it continues to balance the costs and benefits of preparing for the unknown. For investors vying for long-term profit, weighing these worries against longer-term successes will be crucial to objectively inform investment theses.